Don’t get me wrong it’s warm there’s a humid feel here in London but it’s really grey. I don’t really get the Monday blues as working in retail I rarely get a full weekend to myself but today is proving trying. I am really loving my daily blog posts, I’m not feeling the pressure if anything it’s making me want to do more and progress with my content. If it makes me happy and if my readers engage with it then happy days. That’s when I’m at my most happiest here on my little place on the Internet. I’m often inspired at times when I can’t write, like when I’m trying to sleep or in the bath just to name a few. Seeing as Miranda Dickinson’s gorgeous Somewhere Beyond the Sea is released this Thursday I was thinking how can I talk of that more….her magical way of writing is just what I need in my life right now. Saying that I’m not looking forward to the book hangover that will follow. Miranda has written some gorgeous bookish boyfriends for me over the years and I’m pretty much in love with Kieran. I first met him in her ebook prequel Christmas in St Ives and I just loved everything about him. He’s extremely humorous but he’s also very sensitive which is a gorgeous gift in a guy. Where I’m at right now he has only dipped in and out but his humour and sensitivity are there each time he graces the pages. Today I woke up feeling exhausted just thinking about what today holds for me…but I’m hoping it ends with a massive smile on my personal journey too. As I said I was looking at how I could talk more of the sparkly talk ahead of publication day later this week, and then the queen of pure escapism put up a soundCloud clip of one of her songs on her Twitter account. The song in question is called ‘A million Miles’ I must admit I listened to this snippet a number of times whilst getting ready for work and on my descent to work and I instantly felt inspired and awake. I love how a piece of music with such inspirational words could easily change my outlook on my day. Granted it’s still not going to be a walk in the park but Miranda’s song made me dream, think and more importantly it inspired me for the better this morning. Miranda Dickinson thank you for brightening my Monday and for making me reach higher without even realising it. Today might not be great but there will be greatness in today…. Do let me know how your Monday is going and what books or bookish things you are doing? Book Cover Challenge day six – I had to mention this lady. So here I am on time with no catching up. As I have mentioned on a number of occasions Sunday’s are generally my guaranteed day off. Which is why from time to time I like to lazily sit. As I type I’m still in my pjs and my hair needs a good wash ha!!!! Listening to the football. Today marks day six of the book cover challenge, which I am going to miss after tomorrow. So I may have to continue this from time to time as I have really enjoyed it. I cannot do a challenge without featuring this lady. Miranda Dickinson is one of my favourite authors, her books let me escape my own reality, they give me hope, love and they really do put a smile on my face. If I’m having a reading blip she pulls me through. Not only is she a fantastic wordsmith she is a awesome and lovely human being who has given me a well needed boost on more than one occasion about a number of things. 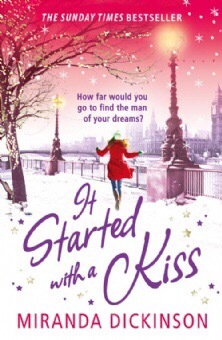 It Started with a Kiss was the first book of Miranda’s that I read. It opened the door for my love for Miranda’s way with words. Over the years I have been a part of #TeamNell and #TeamSparkly helping Miranda promote her books with the latest being one of them in Christmas In St Ives which has my heart well and truly – it links to her next novel Somewhere Beyond The Sea which comes out in June 2018 and can be pre-ordered Here. These characters are so adorable and you can’t help but fall in love with them. I look forward to spending more time with them next year, I’m pretty sure I shall be buddy reading with Catriona again too. I reviewed it over on Dark Readers you can read it Here. 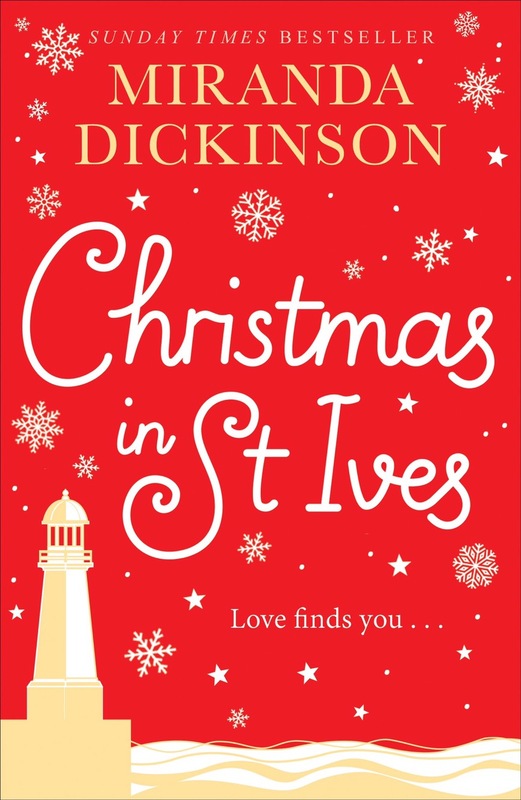 This year Christmas in St Ives has been my first festive read I will be finishing it shortly so it may well be a double Miranda post day. Watch this space. I can’t help but mention Fairytale of New York which is one of my ultimate favourites where my book boyfriend Ed came from and Miranda brought him back to me in I’ll Take New York.